• Alfonso creates symphonic and choral works which audiences enjoy and orchestras like to perform. • His music is very adaptable for film. 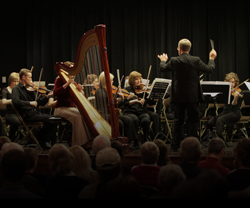 • He also works with film directors to provide high caliber symphonic music. Dr. Michael Palumbo conducting the Chamber Orchestra Ogden in the performance of Concertino for the Harp and Strings.